Home ♦ Coffee ♦ What is Irish coffee? 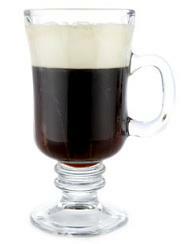 Irish coffee is a hot coffee drink made by spiking strong coffee with Irish whiskey, sweetening it with a little bit of sugar, and topping it with whipped cream. The drink is warming from both the whiskey and the coffee, and it gives you a nice little rush from the caffeine when you drink it. It’s a great winter drink – and it’s perfect for any St Patrick’s Day celebration. The world record for an Irish coffee used 10 liters of whiskey, 10 gallons of coffee, a gallon of cream and about 4 pounds of sugar, and was created at San Francisco’s Buena Vista Cafe, which has laid claim to the creation of the drink. A standard one will be a little easier to take than the record-setting cocktail; usually it’s built in a smaller glass that holds 8 to 12-oz.